The last one, in Bartlett on 10-11 March, 2018, has just finished. It was a great success. Details of the next Spirit Fest, towards the end of this year, will be announced as soon as they’re finalized. Do contact us if you’d like to know more. Michelle Hanson is a wonderful teacher and a bright soul! She has reached a worldwide audience with her popular seashell divination classes. She is also an international author and we are honored to have her in our event! I studied with her for in 2012 and can truly say she is a wonderful teacher! Everyone remembers spending a day at the beach as a child collecting seashells, but what if those seashells were more than just pretty objects? What if those shells could actually tell you something about your hidden thoughts, beliefs, and attitudes? Simply put, seashells function as tools that enable us to speak with our subconscious, allowing the inner self to communicate the information it considers most valuable for our growth. 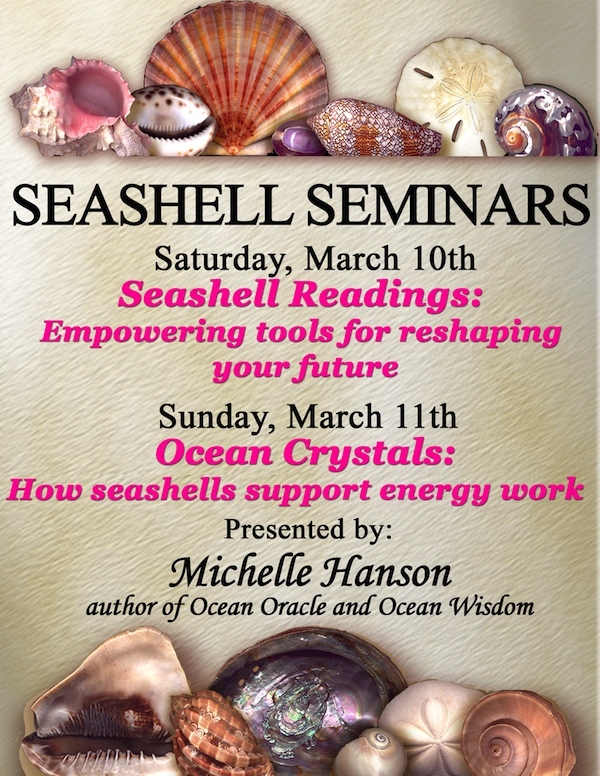 In this seminar, Michelle leads you on an ocean voyage of discovery decoding the language of the seashells. You will witness mollusks, the animals who create and inhabit the shells, in their natural habitats. Along the way, you will meet vampires and heroes, and encounter demonstrations of compassion and intelligence. Your ocean journey will also reveal seashell master teachings on a variety of subjects. By listening to the shells with the guidance of Ocean Oracle, you can tap into your own innate wisdom and joy. Seashells are crystals from the animal kingdom and water element. They contain all the benefits for mind, body, and spirit that are associated with crystals from the mineral kingdom and earth element. In this seminar, Michelle will share the highlights of a 5-year journey with her seashell guides revealing how they partner in chakra work. If you have any Abalone shells at home, you are invited to take them with you to the seminar. You may be surprised at the magic they hold. Allison is an amazing animal communicator. She grew up with the ease of animal communication and people would seek her for insight into their pets and livestock. After an equestrian career and 20 years as a horseshoer, she took formal training for animal communication with international teacher Marta Williams. Allison will be at the Spirit Fest!!! She approaches each session from a place of respect and caring with the goal of bringing about a greater understanding between her clients and their animal companions. Animal communication is the telepathic transfer of information from an animal to a receiver that can influence behavior and increase mutual understanding. With this skill she has the ability to help your pets communicate what a high quality of life means to them. It can create dialog around dangerous or undesired behaviors, bringing a resolution that works for all. Animal psychic work also enables us to communicate with our beloved deceased animal companions. We are very happy to welcome Dr. Tehmekah MacPherson (Dr. T) to our fair!!! She is a dance artist, educator, and intuitive healer. She approaches dance as an energetic language that merges with other art forms to facilitate connection and wellness. Dr. MacPherson specializes in the creative healing, reflective, and inspirational gifts that U.S based Afro-derived dance forms can offer. Drawing from her dance and scholarly background, Dr.T’s movement meditation practice fuses indigenous spiritual insights with embodied symbolism to encourage present moment awareness, balance, and healthy energy flow. Dr.T is founding director of the College Preparatory D.A.N.C.E camp at Colgate University and founding director for Dance Dimension Institute ñ a non-profit organization that offers innovative, engaging, and informative experiences with dance that promote healing and healthy living. She also will be doing one presentation each day at Spirit Fest! Learn about the many benefits this practice has to offer and can assist you for healing. Explore also this unique approach to bring you to present moment awareness, balance and a healthy energy flow! Another great vendor at the fair will be Two Vegan Sistas Restaurant. They offer vegetarian and vegan food. Specialized in Vegan Meal Plans and Catering 100% Vegan, Mostly Organic, Made from Scratch! The owners of Two Vegan Sistas, Bretta and Belinda King, are two biological sisters that are vegan. These 2 sistas have over 30 years (combined experience) in vegan cooking and living. Bretta is a PhD chemist/nutritionist/educator and Belinda is an artist, who has recently left a career in the air force. Shilo is a licensed counselor and experienced Shamanic Practitioner that has been practicing for over 20 years. She trained with the Foundation for Shamanic Studies with Michael Harner and Sandra Ingerman, completing their three year program. She went on to study with Sandra Ingerman and completed the two year teacher training. Wanting a deeper knowledge of indigenous traditions, Shilo went to Africa and studied with P. H. Mtshali, a Zulu Sangoma. From Mr. Mutshali, Shilo learned an ageless method of divination – Throwing the Bones. Shilo is a certified Hypnotherapist and is licensed to teach the Trime-Life weight release program. On Saturday Shilo will give a presentation on Shamanism and Throwing the Bones. She will be available all weekend for Bone Readings. We are at that time of year when many of us are challenged with the #1 New Year’s resolution – to lose weight. Ever wonder how you got caught up in the never ending cycle of limited weight loss, that is soon followed by weight gain? Come listen to Shilo on Sunday as she explains the binge/restriction eating cycles of diet mentality that seem to have so many people steadily becoming heavier. Learn a program of hypnotherapy that can help you end this destructive cycle, and put you on the right track to a healthier you. Shilo has a plan to help you address mindless and emotional eating, make healthy food choices, increase motivation for physical activity and to install inner tools that work automatically to eliminate cravings. This is a medically researched program that is being taught at the Cleveland Clinic Center for Integrative Medicine. Shilo is a certified Hypnotherapist and is licensed to teach the Trime-Life weight release program. Rebecca Leigh has had the ability to see, hear, and communicate with spirit since she was a child. Raised in a spiritually open family, she has spent years cultivating her abilities through a wide array of research, educational opportunities, and spiritual teachers. As a seeker, she continues a life-long quest to expand her knowledge spiritually and how to best use her gifts to help others, with love and compassion. Rebecca is able to deliver messages from the spiritual realm by connecting with spirit, via the client’s energy or through psychometry (reading energy through a personal object, jewelry, etc.). A private and confidential session provides guidance and clarity for one’s spiritual and life journey, in the present moment and in the future. Offering watercolor aura portraits, and jewelry copper and enamels. John is multifaceted and creative! His interesting background has a wide range of experiences including a year in Catholic Seminary, studies in Comparative Religion at McKendree college, Illinois, working as professional computer programmer, and a firefighter. Book such as the Book of Tao, the works of Carlos Castenada, the Zen Buddhism of Jack Kerouac and the pantheism of Spinoza have been a strong influence for his exploration of spirituality. John has been a guest sermonist at Unitarian churches, and currently teaches there Adult Religious Education. As an artist, John is self-taught. He has crafted jewelry using casting, fabrication, wirework, and exotic woods, and currently works in enamel. He has written tutorials for a nationally-distributed jewelry art magazine, and won a Staff Choice award at the WKNO Action Auction. John combines artistic vision with spiritual attributes to create his watercolor Aura Portraits. These are an artistically-rendered impression of an individuals’ personal energy field and occasionally clairvoyant images. John empathically perceives these as colors in his inner vision; each color relating to positive or negative energy in the subject’s chakras. Beautiful artistic creations, created with love by Reiki practitioner Tess Schwartz. Her creations include functional ceramic pieces, vases, mugs, candle holders & more! Chakra oils, essential oils infused with crystal energy, botanicals, Reiki and Solfeggio tones. Natural/organic body products. Would you like to write a book and don’t know where to start? Do you have a book to publish and don’t know where to start? Come to this presentation to learn more about it. IAM Press specializes in assisting first time authors and assist them to write and publish their books. Whether you are primarily interested in personal unfoldment or seek to be of service in altruistic manner, the Universal Laws are the fabric of being, the rules of this game of life. Learn about them, understand them and learn to identify them in your life! Discover Yoni steaming, an ancient healing practice that women have been using for centuries. It offers an opportunity to reconnect with the body and utilize the wisdom your womb carries within. 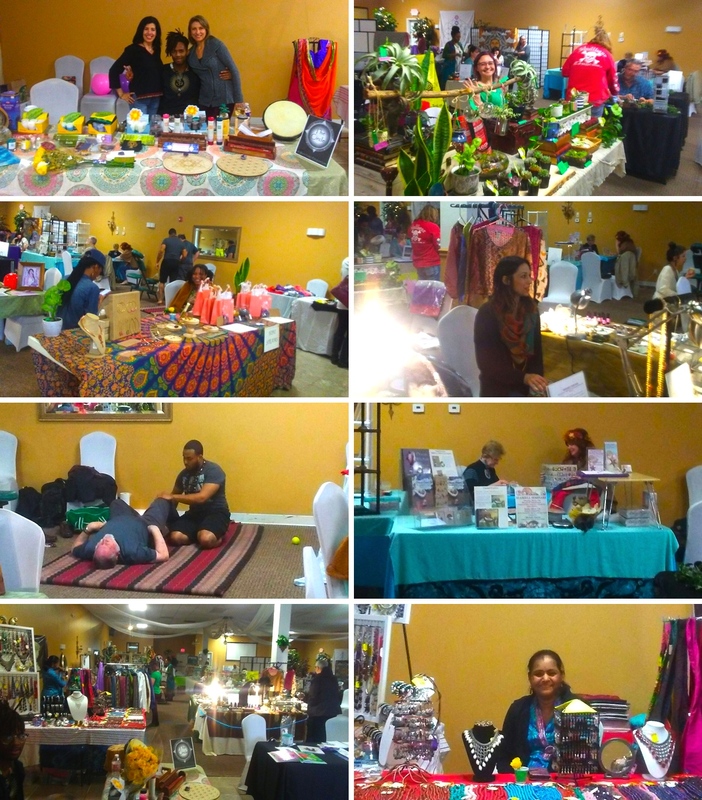 Divine Self Love uses organic herbs to prepare the packages specifically design to bring healing and balance. Some benefits of this practice are: significantly reduce pain, and discomfort associated with menstrual cycles, ease symptoms of menopause, release store emotions, detoxify the womb and remove toxins from the body. Lunar Alchemy is an innovative, advanced stress reduction technique. When the Lunar Alchemy system is applied to the subtle energy field of any person, place, or thing, it transforms that person, place or thing into a systemic alchemist. A systemic alchemist automatically transmutes all subtle energies in the energy field from non-beneficial to beneficial, and self-selects the beneficial subtle energies over the non-beneficial ones. After Lunar Alchemy is applied to your smart phone or other electronic device, that device will no longer weaken anyone’s energy field. It would specifically be for people with Smart Phones. If they want they can bring tablets instead, that is okay, or they can bring both. The system is best demonstrated with smart phones that are not previously corrected with various stickers. With intention, I would shift the subtle energy system of their smart phone (or tablet), and demonstrate how to use the newly trained smart phone to shift the subtle energy qualities around other electronic devices. The system retrains the device to automatically transmute non-beneficial subtle energy qualities to beneficial ones. The shift is permanent. I would demonstrate the energy shift with before/after muscle response testing. During this presentation, learn about a technique that shifts the subtle energy system of a smart phone (or tablet). This demonstration will show this technique shift the subtle energy quality of a smart or tablet. and retrains it to automatically transmute non-beneficial subtle energies into beneficial ones. Muscle testing before and after will be utilized to demonstrate the shift. A discussion of the importance of self care, self care strategies, & assist attendees with creating a self care plan. 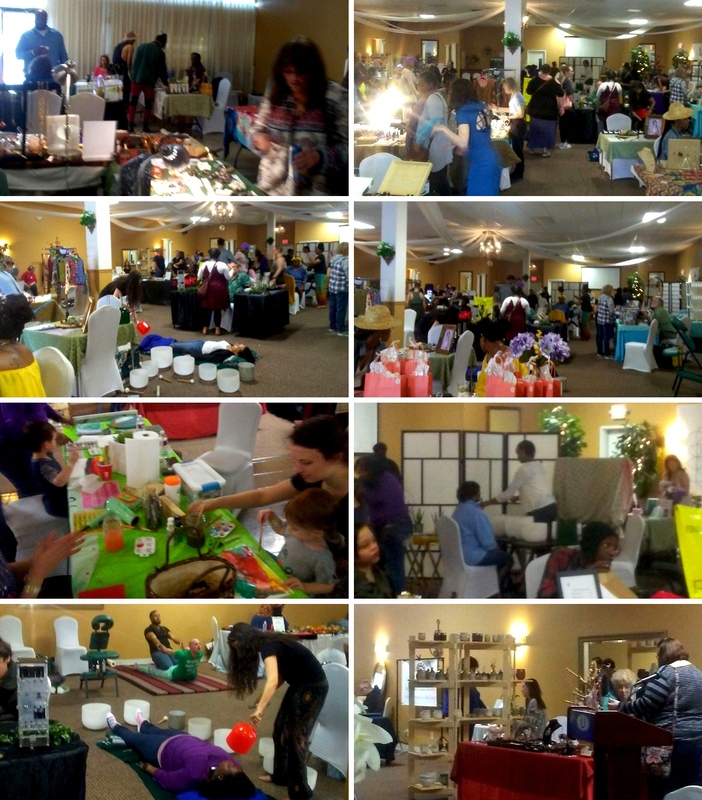 Crystal Jewelry, wireworks, clay arts & crafts such as wands, fairy doors and much more! Originally from California, Indigo N. Moon is a Cosmic Explorer and an Excavator of Truth, who uses a mixture of tools for both her benefit and those around her. She is a Reiki Master practitioner, an intuitive guide, a creator of natural products, an Energy Worker (with a focus on Chakra Therapy), and soon will be a graduate of the Massage Institute of Memphis. A lifelong seeker, her goal is to awaken the magic in your soul and help others find healing. Crystals, Astrology Oils, jewelry and more! Using essential oils for your health and wellness. Learn about essential oils and aromatherapy, and the many benefits these offer! Join Dinah as she shares her expertise in essential oils. During these presentations she will teach about the top ten essential oils! Learn to use nature’s medicine to live a healthy life and replace the toxins in your home and body. Offering a variety of plants and terrariums. Shilo is a licensed counselor and experienced Shamanic Practitioner that has been practicing for over 20 years. She trained with the Foundation for Shamanic Studies with Michael Harner and Sandra Ingerman, completing their three year program. She went on to study with Sandra Ingerman and completed the two year teacher training. Wanting a deeper knowledge of indigenous traditions, Shilo went to Africa and studied with P. H. Mtshali, a Zulu Sangoma. From Mr. Mutshali, Shilo learned an ageless method of divination – Throwing the Bones. Learn about the importance of self-care and self-care strategies! A discussion of the importance of self-care, self-care strategies, & the creation of a self-care plan. Learn about animal communication. During this presentation, Allison will share some of her experiences and will do a live demonstration. Using essential oils for your health and wellness. Learn about essential oils, aromatherapy and the many benefits these offer! Join Dinah as she shares her expertise in essential oils. During this presentation she will teach about the top ten essential oils! Learn to use nature’s medicine to live a healthy life and replace the toxins in your home and body. What is creativity? Is it a talent? Do you have family members who can draw or play music and you can’t? Does that mean you’re not creative? John draws on multiple disciplines (anthropology, psychology, neurology and spirituality), to share a model of creativity that can be incorporated into how you live and experience life. Paganism is a word that describes a rather wide range of beliefs and practices, some of which date back to long before Christianity. We know that early Americans had a fear of witchcraft and practitioners of magic. What beliefs are included in the word ‘paganism’? What characteristics do the various forms of paganism have in common? Where and how did it survive Christian Europe and come to America? Come and find the answers to these and other questions, and learn about paganism and what paganism might contribute to your spiritual life. Discover movement meditation with Dr. Tehmekah MacPherson. Learn about the many benefits this practice has to offer and can assist you for healing. Explore also this unique approach to bring you to present moment awareness, balance and a healthy energy flow! Learn about animal communication and telepathy. During this presentation Allison will share some of her experiences and will do a live demonstration. During this presentation learn about a technique that shifts the subtle energy system of a smart phone (or tablet). This demonstration will show this technique shift the subtle energy quality of a smart or tablet. and retrains it to automatically transmute non-beneficial subtle energies into beneficial ones. Muscle testing before and after will be utilized to demonstrate the shift.